Controlling A Situation | THE INTERROGATION ROOM! 3) Be Yourself – If you are not yourself, you are either somebody else (a lie), or nobody at all (a void in search of something to fill it — as an empty vessel). The Bottom Line: You must be fully self-aware and self-secure if you are to command yourself. And you must achieve true command of yourself or cannot ever command others. This nbot just about discipline — no, this is about integrity of purpose and presentation. 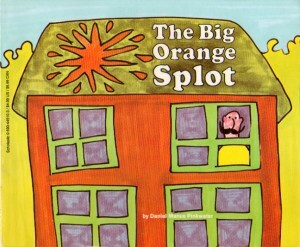 The Big Orange Splot is a children’s picture book by Daniel Manus Pinkwater. It was published in 1977 by Scholastic Inc, New York. The age range is ages 4–8, and all 32 pages have a full color picture, which helps the child visualize when reading. Despite this, the book uses many large words, and cliche’d phrases referring to the story’s protagonist, Mr. Plumbean, making the book almost targeted at adults as well, and helping the children’s vocabulary. The drawings were made with markers, and if one looks closely one can see the marker lines. When my ex-wife read this story to my daughter (she’s quite grown-up, and recently became engaged) at bedtime, I had to leave the room and weep. The message was so profound and so personal. It opening a portal to a part of myself that I had suppressed for many, many years. Once acknowledged and attended to, that part would never let me forget about it again. The genie was forever out of the bottle. That last part is a lie. We are confined for the comfort of others, as they were confined for the comfort of those who parented them. And so the cycle repeats itself. You have to break it, and to break free of it in order to become the great individualist and leader that was and remains your very birthright. It’s been stolen from you; you must sneak out of your cubicle, cell or row house and reclaim it. And now, as an adult you must become an uncorruptible sentinel of your true identity. Stop flagellating yourself for being who you really are. Get out of your crypt, shake the scales from your eyes, and put your fingerprint on the face of the world, Leader.